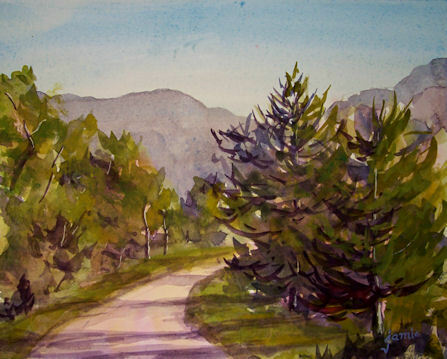 This is one of my favorite areas of the Catskills to go hiking, picture-taking, and painting. The mountains are so dramatic, and there are places where the road winds through the clove and drops off so steeply that it takes your breath away! This one was painted from a photo. Doing this made me eager to get back there again. I can’t wait till spring arrives! This vase belonged to my great aunt, who was one of the sweetest, kindest ladies I’ve ever known. She lived to be 106, and I’m sure would be thrilled to see her vase in this painting! 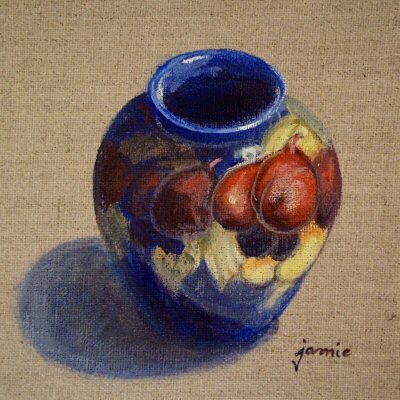 I love this little vase with the colorful plums circling the ultramarine blue. 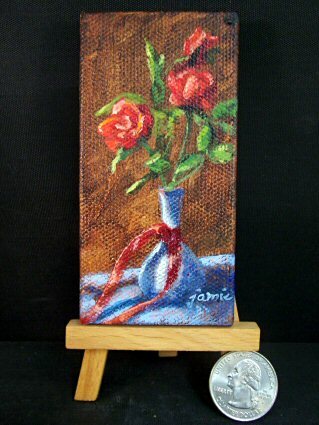 The beautiful linen color and texture is visible, and the surface is a joy to paint on. 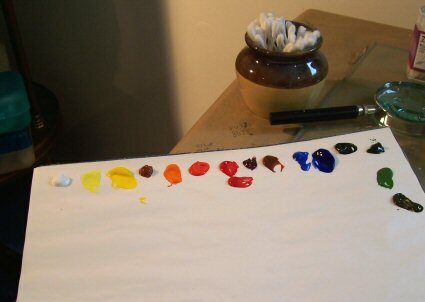 Many artists pre-prime boards or canvas to this warm linen color, but there’s nothing like the real thing, using a clear primer. This is another sunrise view from my living room window. 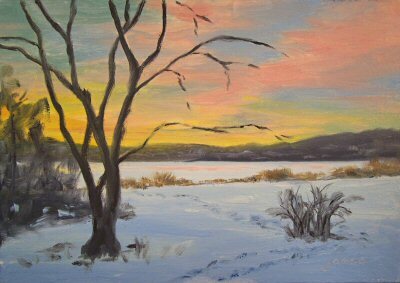 I really enjoy painting “plein air” from there in real time, but this one was done from a photo I took one beautiful winter morning. The quote above is inscribed around the stretcher bars on the back of the canvas. Quarter is in the image for size reference only. I immediately thought of this quote when I set up to do this painting. The canvas is gallery wrapped, and the image is painted around the sides of the canvas, so that it can be viewed from all sides. 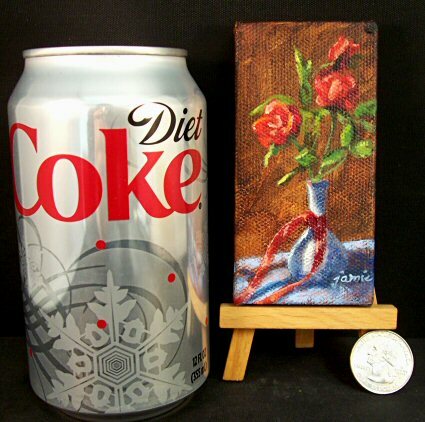 The miniature easel will be shipped with the painting. I had a few other colors out there as well, but the ones listed above were the ones I used. 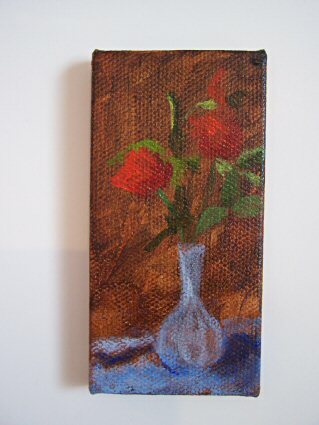 I toned the mini canvas and the sides with a mix of Transparent Red Oxide and Ultramarine Blue Golden Fluid Acrylics. Those dry quickly, so with a little help from my hair dryer, I was then able to use Golden OPEN Acrylics to paint the rest over that toned canvas. I started working on the basic placement of shapes, and then worked more and more toward contrasts and details. I use blu-tack to adhere the mini canvas to a larger piece of foam board. That way I can hold it securely in one hand when necessary, while painting with the other.